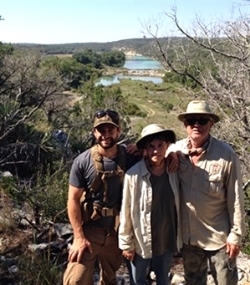 Ruthie Russell (center) owns Sycamore Canyon Ranch, which borders the Devils River. “If I was a billionaire, I would buy as many ranches as I could and preserve them all,” said Ruthie Russell, owner of Sycamore Canyon Ranch in Val Verde County. “But all I can do is keep doing my best to preserve the land I do have. Especially for legacy landowners, land stewardship starts with the deep passion that you have for the land; you’re so bonded to it,” Russell said. Russell is a third-generation cattle woman and one of the landowners recently recognized by the Texas Parks and Wildlife Department (TPWD) with a 2014 Lone Star Land Steward Award.